Tomorrow, the 12th November 2015, we will publish our fourth title – a tiny masterpiece from one of Germany’s finest writers and with illustrations from a brilliant French cartoonist. We couldn’t be prouder of the book that we’re about to share with you, but we also wanted to share the story of how we came to publish this novella and some of the exciting and (let’s be honest) slightly scary moments along the way! 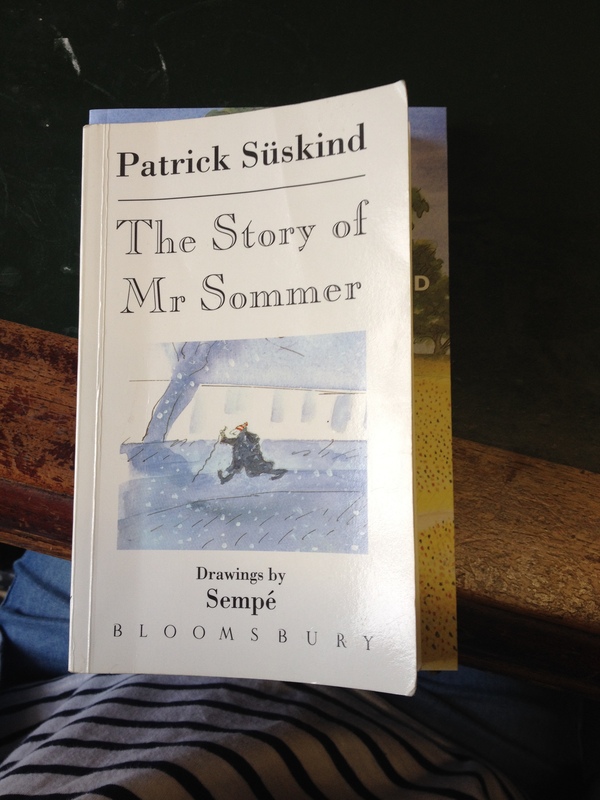 We first came across Patrick Süskind’s “The Story of Mr Sommer” via a customer enquiry at our bookshop Mr B’s Emporium of Reading Delights. 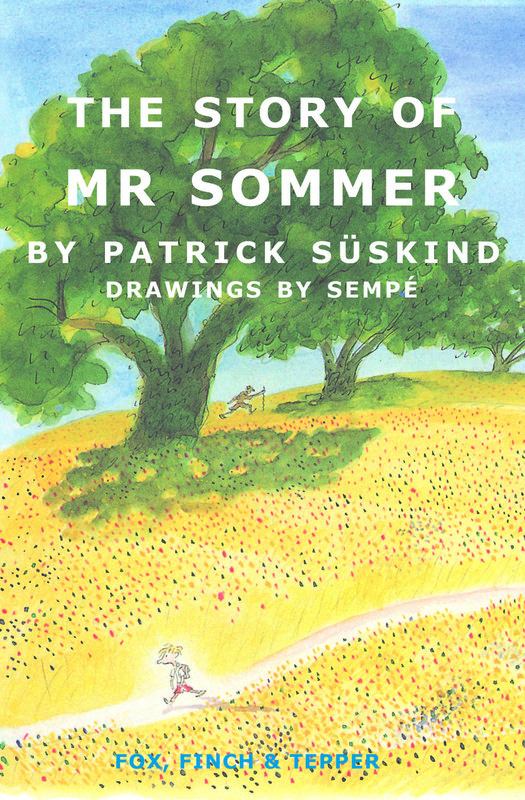 We couldn’t believe that a novel by a bestselling author like Patrick Süskind could possibly be out-of-print – but somehow “Mr Sommer” was. We ordered a second-hand copy for the customer and when it arrived, we were struck by its beauty – a tiny white book with a wintry cover and with whismsical colour artwork from the illustrator of “Le Petit Nicolas”, Sempé. Another copy was hastily ordered and we devoured it. After a passionate pitch and a fair amount of contractual paperwork (I won’t write about that, contractual paperwork doesn’t make for exciting reading!) we were granted the rights to publish Süskind’s wonderful novella and we swiftly got to work. With three great novels under our belt we were beginning to feel as though we had got the hang of this publishing malarkey. 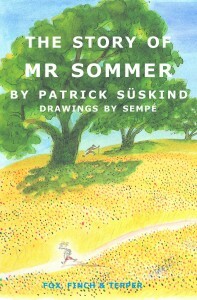 And then along came “Mr Sommer”; a novella studded with colour images which we wanted to reproduce in all their glory, and with the challenge of an upsizing project to transform it from its petite stance (the previous edition was published in a smaller format) to a full-size paperback, which could be proudly displayed on our customers’ bookshelves alongside the other Fox, Finch & Tepper titles. The resize turned out to be the more achievable of the two big challenges, some clever spacing, a bit of fiddling with the kerning button (the typesetter’s best friend) and we had a luxuriously spacious text that kept all of its words and images in the same settings as the previous smaller edition. The image reproduction was a little trickier, and I warn you, this is when it all gets a bit geeky because what we soon realised was that when you publish a book in which the images are so important you had to get the choice of paper and print method ABSOLUTELY RIGHT… cue many print drafts! We sent poor old Mr Sommer and his boy narrator on a circular loop from Fox, Finch & Tepper towers in Bath to our lovely printers T J International in Cornwall and back again, many, many times. 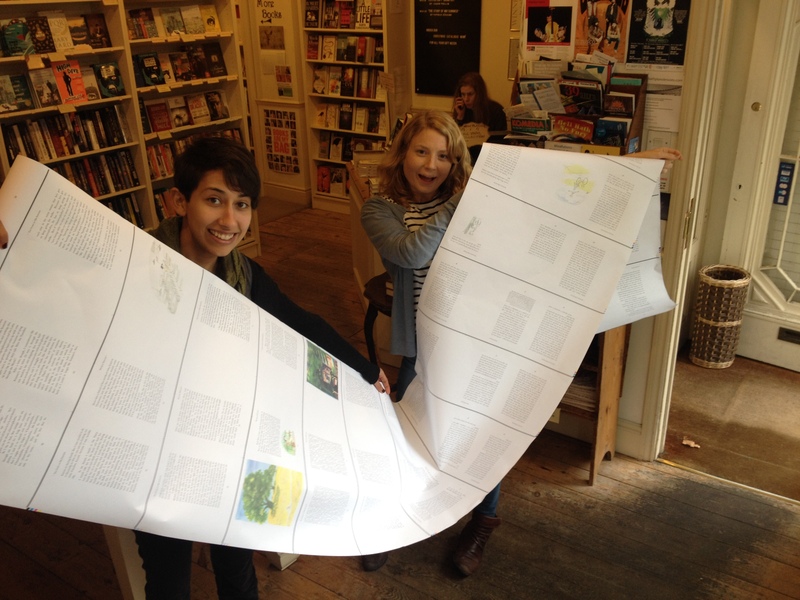 And each time, when they returned to us on giant rolls of paper that we unravelled across the length and breadth of the shop to examine fastidiously in many different lights, we greeted them with new bewildering comments. “The paper isn’t opaque enough”. “The images aren’t vibrant enough”. “The blue is too blue”. “The yellow just isn’t yellow enough”. Eventually, a print test arrived that did justice to Sempé’s illustrations – blues and yellows achieved perfect harmony, all of our other quibbles had been remedied and the print button was duly pressed. I can’t describe the joy I felt when the book arrived back from the printers, it was a giddy, warm, potentially-quite-irritating kind of happiness. Every detail was even better than I had imagined it would be, right down to the tiny, flirtatious Carolina Kückelmann (the object of our boy narrator’s affections) on the spine. 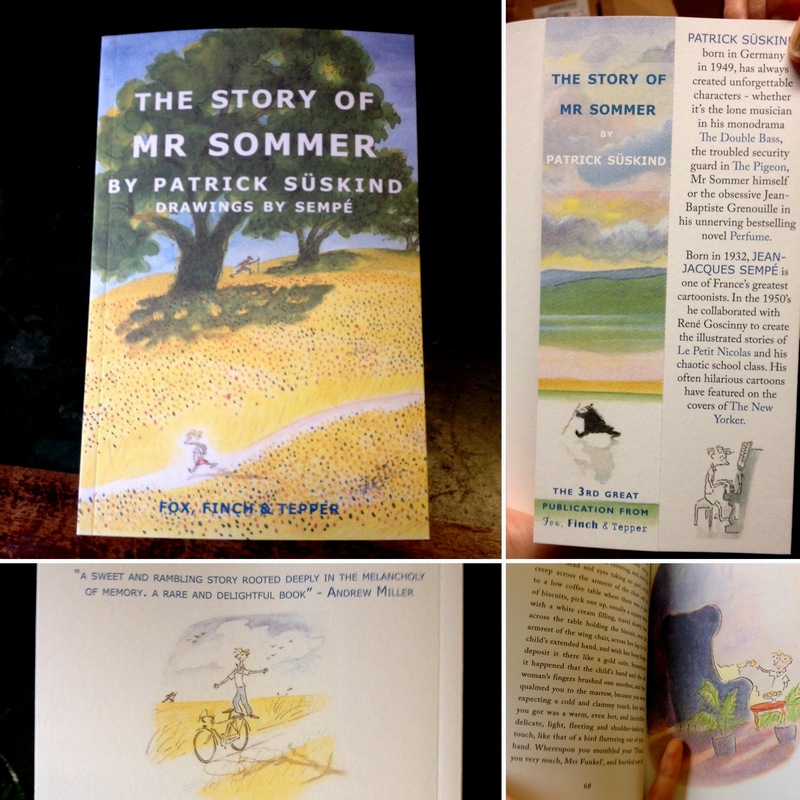 A sneaky peek at Fox Finch & Tepper’s edition of “The Story of Mr Sommer”. Published 12/11/15. 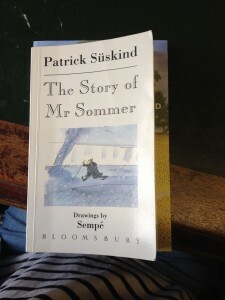 Our story of “The Story of Mr Sommer” wasn’t always a smooth journey, (the best stories aren’t) but it did dish out some valuable publishing lessons along the way and it does have a superbly happy ending. I’m so excited to share this beautiful book with our customers and with the customers of all good high street bookshops around the UK later this week. Happy reading everyone!